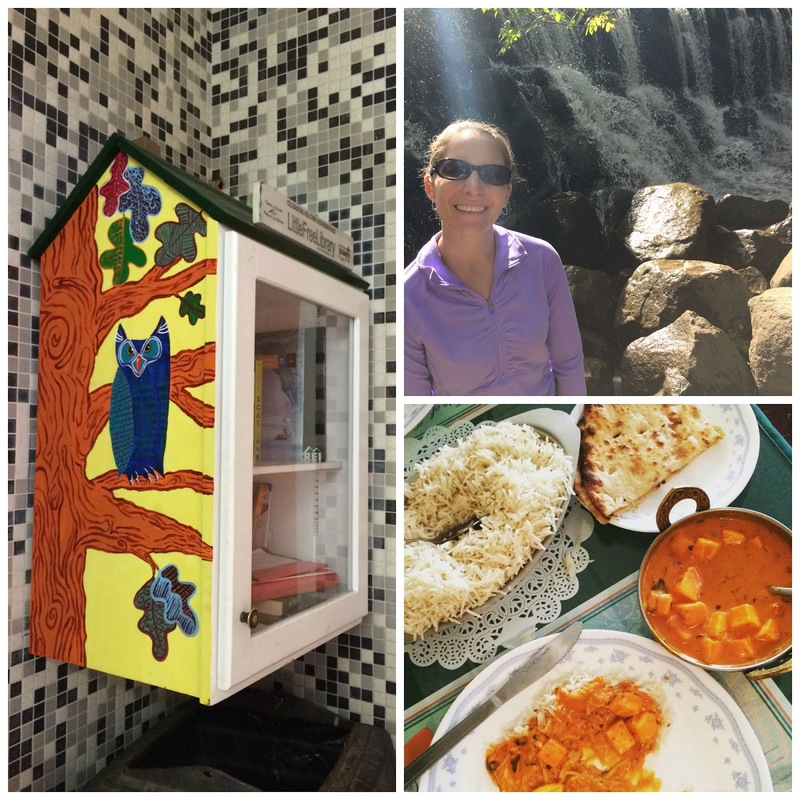 Weekend Recap: Nature Center visits, House Hunting and Indian food! How was your weekend? 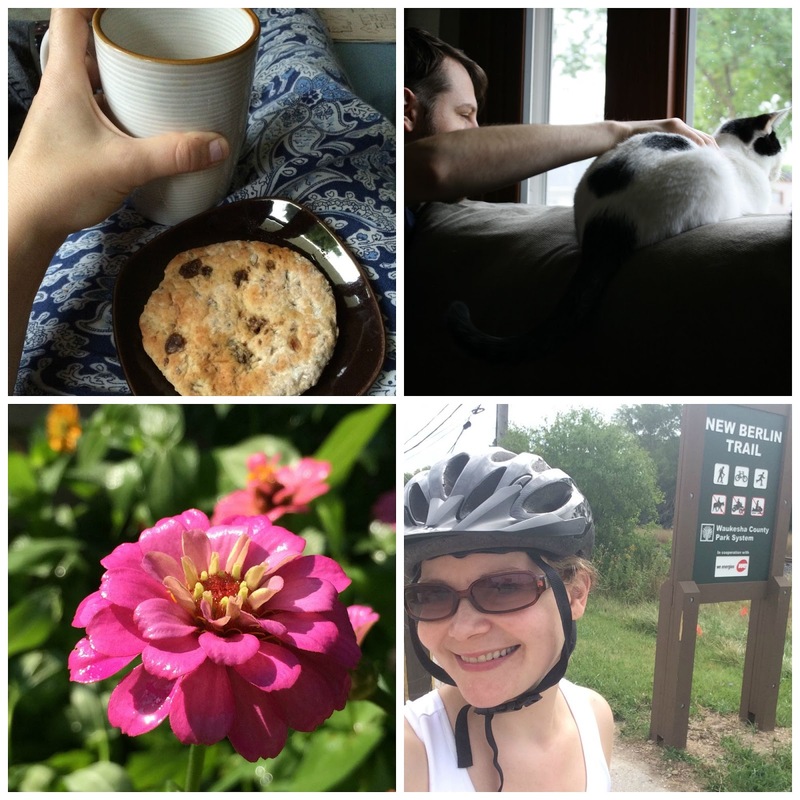 I had a productive and fun one filled with two nature center visits! Craig and I headed to the Apple Harvest Festival at Retzer Nature Center in Waukesha on Saturday afternoon. 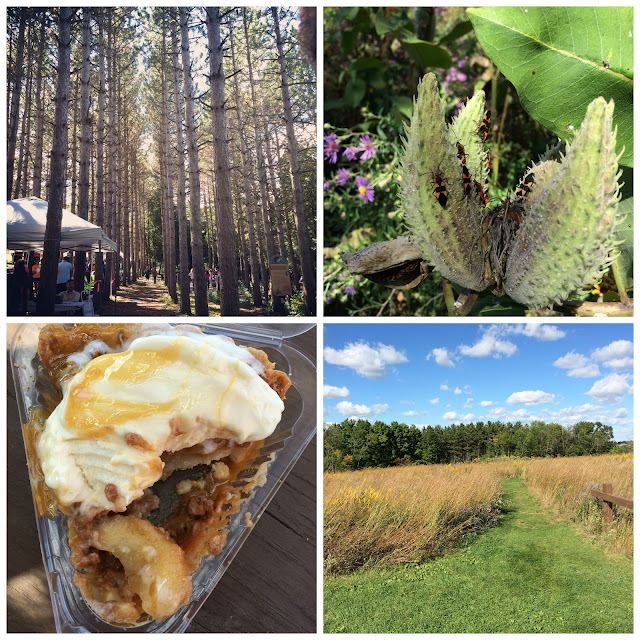 We went on a hayride, a guided hike and enjoyed sharing a slice of apple pie with ice cream and caramel on top. We also did some house hunting while we were out in Waukesha County. I've found it is always best to drive around subdivisions and get a feel for them. That way I know what areas to keep focusing our search on. Things we love: hilly countryside courtesy of the glaciers, sidewalks since we take lots of walks, some mature trees near a subdivision and of course, a few places to shop and eat at nearby. 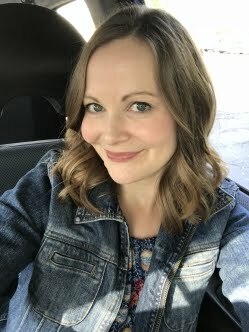 After a morning of cleaning (we're trying to weed out things in the house since we hope to move soon), we went on a walk mid-morning today and then I got ready to meet my friend Danielle. We hiked Whitnall Park's pond and bug day was going on at Wehr Nature Center, so the place was packed! I was excited to find an adorable Little Free Library near the restroom at Wehr. Danielle loved seeing the waterfall at Whitnall Park for the first time. Besides getting a little off the beaten path and getting into some mud, we had a nice hike. After a hike of over 6500 steps on my FitBit, we earned our delicious dinner at a fantastic Indian restaurant. I'm a Paneer Butter/Tikka Masala girl and Danielle gets the chicken version. It's hard to order something than our favorites. We got amazing coconut naan and mango lassis too. I'm on the hunt for a replacement mop head and can't seem to find the one we need anywhere, so I stopped at Wal-mart on my way home. Nothing there either. I did get distracted by the Pioneer Woman's cute kitchen products though! The pretty painted bowls reminded me of ones you'd see at Anthropologie. And this card is so my family (before I was born). I texted it to my mom! Four boys and two girls in the 70's, right before the baby (me) was born in 1980. Now we're just watching the Packers game and relaxing a bit. I need to go meal prep and get ready for the week! See ya! 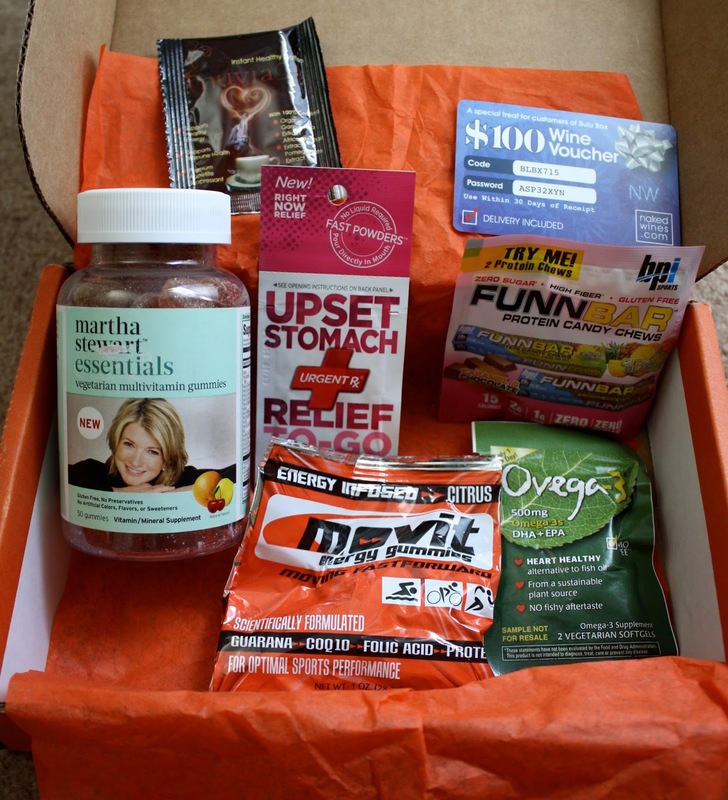 Disclaimer: I was selected to receive the Bulu Box as part of my Sweat Pink ambassadorship. All opinions are my own. I love trying subscription boxes and receiving goodies in the mail, so I jumped at the chance to try Bulu Box. Bulu Box is the first health, nutrition and weight loss discovery box designed to help you feel your best. Each custom box comes filled with a new mix of 4 to 5 premium samples from top brands to try. Every sample is sufficient enough to decide if the product is right for you. When you go to their website to sign up, you can pick boxes focused on either weight loss or general health. You take a survey, which asks questions like how good you consider your health to be, if you follow any special diet, how many days a week you exercise and what types of products you are interested in receiving. I enjoyed trying all new to me brands and products. Each box comes with a card describing the products and what a full sized version retails for. Sign Up: Choose between Bulu Box or Bulu Box Weight Loss and then select either a monthly, 3, 6 or 12 month plan. Like most subscription boxes, if you sign up for 12 months, you save the most money. Earn Reward Points: Earn 100 points (equal to $10) or more each month for completing sharing & subscribing. Cash out: Use your Reward Points to purchase your favorite products! Ready to try it? Use the code below! Disclosure: I was sent two packages of Freekeh in exchange for this post. Thanks to Sweat Pink for coordinating this partnership. I love trying new foods and when I got the opportunity to try Freekeh, I was excited to experience cooking with a new grain. 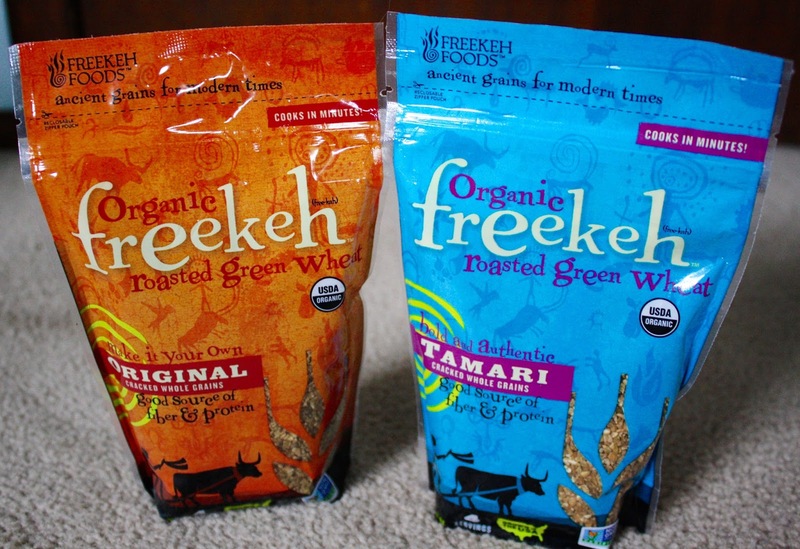 Freekeh Foods sent me two packages to try--tamari and the original flavor. What is Freekeh? Here is a history from the freekeh foods website: Freekeh is a process which means “to rub” in Arabic. Freekeh was created by accident nearly 2,000 years ago when a Middle Eastern village was attacked and their crop of young green wheat was set ablaze. Most folks would sulk over their misfortune, but the crafty villagers rubbed off the chaff, cooked it up and “Eureka!” Freekeh was created. Freekeh has up to three times the fiber and protein found in brown rice, and fewer calories than quinoa and white rice. Freekeh is a great choice to use in recipes you already enjoy, from salads, to soups, to main dishes—the cook times are comparable to brown rice, so it’s easy to choose Freekeh! 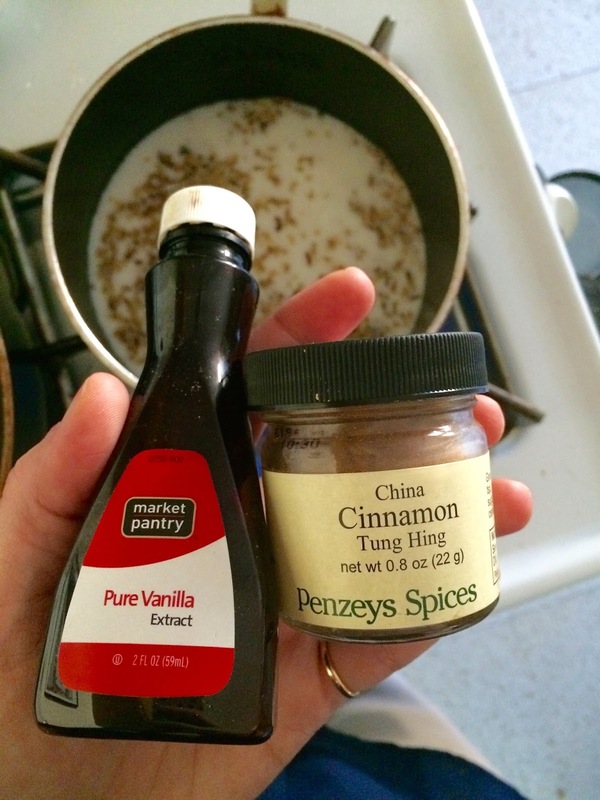 I decided to make a simple bowl of Freekeh with almond milk, vanilla extract and cinnamon from the Freekeh foods website. The recipe also recommended adding Earth Balance or butter. In the end, it was a delicious and filling bowl. Here are the nutrition facts from the original packaging. I first learned about Freekeh from this Greatist article a couple of months ago. I like that it's low on the glycemic index and high in fiber, which I am trying to increase my intake of. Now is your chance to win one package (original, rosemary sage or tamari flavor) of Freekeh to try! US entrants only please. Giveaway ends at midnight on September 15th, 2015. I will e-mail the winner directly and they will have 48 hours to respond. I've loved Trader Joe's since I lived in Northern California. I was so happy when one opened up near my house a couple of years ago. I continue to shop there every couple of weeks for certain essentials like unsweetened almond milk, fruit and veggies, chocolate bars, eggs, etc. I love receiving their newsletter in the mail which includes recipes and descriptions of new products. Here are a few favorites I purchased recently--some new to me and some items I stock up on regularly. Cards- they're only 99 cents and boast super cute designs and messages! Organic pink lady apples- this variety became a favorite when I lived in Switzerland. I try to purchase organic whenever possible and this bag was only $5.99. To the power of seven organic juice blend- I'm not a big juice drinker, but I really enjoyed this flavor. Organic Sriracha ranch dressing- I tried this on a whim and it's everything I expected it to be-spicy & different. It's great on salads or sandwiches. Organic Power to the Greens-a blend of kale, spinach and chard that I love to add to salads, smoothies and on sandwiches. 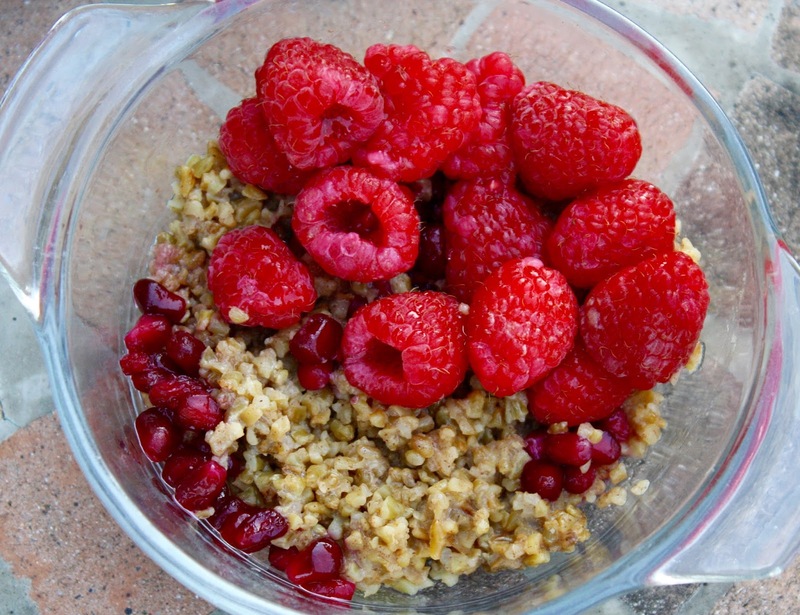 Gluten free Ancient Grain & Super Seed Oatmeal-A great combination of healthy ingredients in one bag! 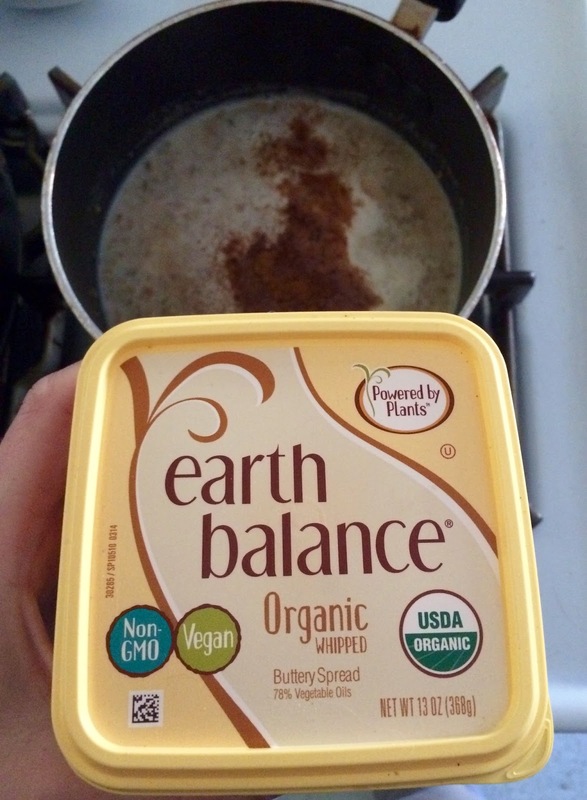 It contains whole grain rolled oats, quinoa, amaranth flakes, almond slivers and sunflower, pumpkin, hemp, flax and chia seeds. 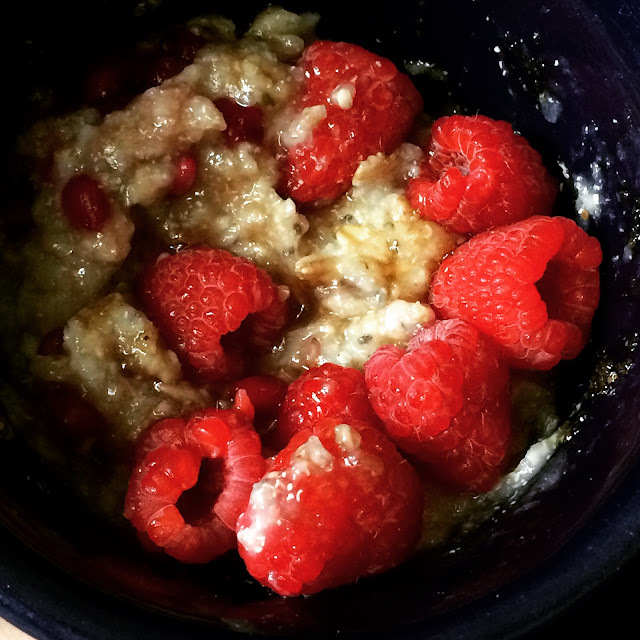 I add berries and a bit of brown sugar to the mix to sweeten it up. Tofu Spring Rolls- I love to keep a package of these on hand for those mornings when I don't know what to pack for lunch. 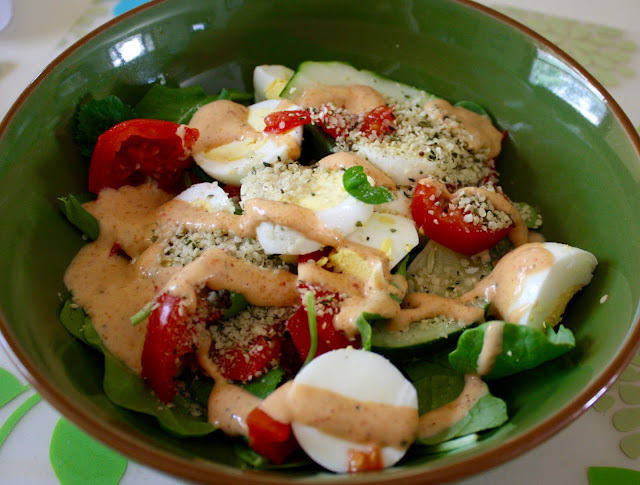 Sriracha dressing on a big salad. The Ancient Grain & Super Seed oatmeal is delicious with pomegranate seeds and raspberries! If you shop at Trader Joe's, do you have any items you purchase on a regular basis or any newer favorites? I've been off of work and had a productive week long vacation filled with visits with friends, a former colleague, cleaning, eating out, getting my car fixed, taking a senior citizen fitness class with my mom, etc. It's been nice having a break and I am not ready to go back to work tomorrow. Here's a few photos from my time off. I redeemed my free birthday drink at Starbucks on an Evolution Fresh sweet greens and lemon drink. It honestly wasn't my fave, but I knew it was healthy and drank it anyway. 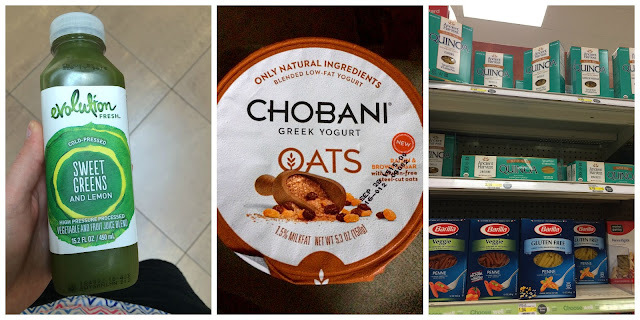 I've been trying a few new Chobani flavors that I found at Target. Also spotted at Target but not purchased yet-they are now selling Quinoa pasta there. I usually ordered this brand online in the past and I am excited I can pick it up at Target now. 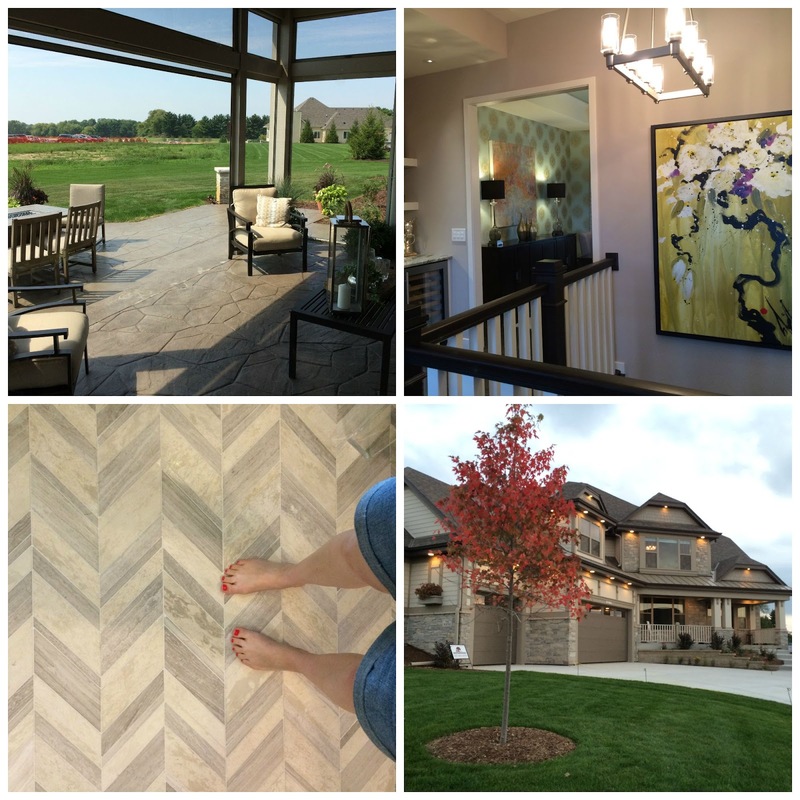 Craig and I visited two sites on the Parade of Homes in Menomonee Falls and Delafield. I can safely say I liked about 85% of the houses we saw. Most of them had white kitchens and wood trim throughout the house and I've grown to love this combination over the years. Home gyms in finished basements--this yoga studio with a mirror made me envision future plans of starting my own personal training business in our house. The sign below on the right pretty much sums me up. Yes, I'm a Virgo, but I am a messy one at times and I generally know where everything is, unless you mess up my piles. A Wisconsin themed guest room made me smile. Other things I love: the grey walls trend, bold area rugs, screen porches, porch swings, exposed basements because they're so bright and cheery, chevron flooring, the return of the Milwaukee bungalow (although the version we saw was HUGE) and lots of windows. Let's just say that I really know what we like in a house and it's going to be very difficult to find a somewhat older house that meets our needs. We've just started looking and it's not easy to find something with our style so far and we do not want to remodel. I ate out so much in the last week and to be frank, I am pretty sick of it. 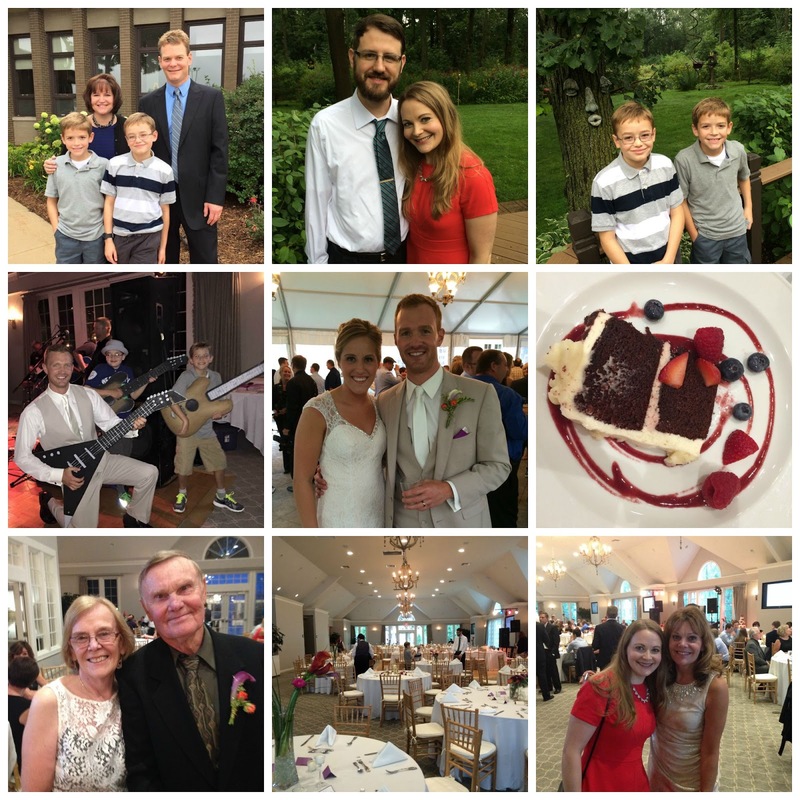 One place we visited with my in-laws that we loved the atmosphere of was Kegel's Inn at 59th and National Avenue. It's been owned by the same Austrian family for about 90 years and I enjoyed trying to translate the German writing on the wall. Too bad it's not uber friendly for a vegetarian eater like me. I ordered the onion rings and had some items from Craig's fish fry plate. Enjoyed breakfasts at home instead of rushing to eat like I do on work mornings. My mom gave me a Muesli morning bun that she found at Costco. I really enjoyed it. Played with the kitties. I am seriously going to miss being away from them at work all day. Spent time outside and enjoyed the last bits of summer--flowers, lots of walks, hikes, etc. Finally went on a bike ride with Craig this morning from Greenfield Park onto part of the New Berlin trail. We didn't get on as many rides as I had wished we would this summer, but we have walked almost every single day. My nephew Andy got married last weekend and we had a fun time in Port Washington enjoying their special day. The reception was at the Watermark at Shully's, which was gorgeous! Back to the real world tomorrow! Luckily it's just a four day week!